The last of the farmers’ market strawberries have come and gone. Each year, as with asparagus, there is the fervor among the food set, especially those who try to eat as seasonally as possible, to hunt out and obtain, for as many weeks as is feasible, locally-grown, tangy-sweet, juicy strawberries. I know that this might seem strange as you think, “What is this about? I see strawberries all the time. They are in my local grocery store year-round.” Those specimens you see in the plastic containers during the winter are a far cry from the ones to which I am referring. They could almost not even be the same fruit. It is amazing to me that I have become such a convert, with all the zeal and ardor that implies. In general, I don’t like strawberry-flavored things. The person who picks off the chocolate and vanilla from the Neapolitan ice cream, that would be me. Strawberry milkshakes, yuk, no thanks. Strawberry NESQUIK® – bleah. Twizzlers®, nope. Fresh, seasonal strawberries, however, make my mouth water. I become obsessed this time of year, waiting, scoping out the markets, eager to catch the new crop. I cannot be tempted by the ones “as large as my head” (to quote one of my sisters) that one finds most months of the year. At the same time, I am now part of the strawberry-obsessives club as well. I shun them out of season. Chocolate-dipped ones offered to me in February are turned down with a crinkle of my nose (a habit I have for things I find distasteful). No, my taste buds know the premium article. They will not be led astray. I do my own cooking and food photography so I wanted to be sure that for sake of trust, I upheld full disclosure as to the prep for this recipe. So that y'all could see what this dish looks like, I confess that I had to cave and use organic strawberries I found at the grocery store. I stand by my point - they don't match the taste of the locally-grown farmers' market ones - but at least you can see what a nice presentation this dish will make if you can still get your hands on some of those. I am a longtime lover of strawberries. Santa Cruz is a big strawberry producer and I remember well my mom picking up flats of the berries fresh from the local fields when I was a kid. I was also lucky enough to have my birthday happen in the middle of strawberry season so every year we had fresh strawberries on my cake - they were also in my wedding cake! Now I'm lucky enough to have my own berries growing in our backyard in SF, the cute little bushes are bursting with fruit, it's hard to be patient but soon they will be ready. 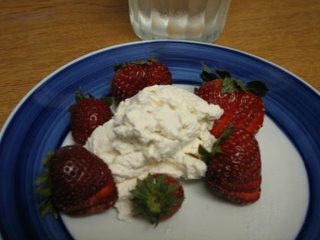 Have you tried strawberries with sour cream and brown sugar? Dip a fresh berry into a little sour cream and then into brown sugar and then bite into a little heaven. I'm thinking it hits the same sweet and tangy notes as your sweat cream and vinegar which I am going to have to try. Jules - Oh, now that the season is at an end here, I'm so jealous that you have them in your backyard. I think you are right, that tangy-sweet balance that both recipes provide is a refreshing counterpoint for this hot summer weather!